Tenacious, gregarious, aggressive, dependable, adaptable... we probably love sparrows because they show many of the same characteristics as humans. We can connect with that pair of House Sparrows – one minute showing affection to each other on the guttering, the next minute feeding a ravenous fledgling and then joining in a noisy squabble with all their neighbours in the hawthorn hedge. But do you look closely at the sparrows coming day after day to the bird table and the feeders? What if there was a bird so close in behaviour and appearance that it may slip in with the House Sparrows and feed without us taking a second glance. Well, take a closer look, because there is such a bird and it’s the Tree Sparrow. Usually regarded as the country cousin of the House Sparrow it is increasingly taking advantage of the widespread growth of bird feeders and nest boxes in rural and town edge gardens and, unless you are familiar with the subtle differences between the two species, you may be forgiven for having overlooked it. Slightly smaller and more agile, unlike the House Sparrow there are no plumage differences between the sexes and the young of the Tree Sparrow, so once you have your eye in, as they say in ornithological parlance, you may start seeing them regularly. They have the typical cheeky sparrow demeanour but the rufous crown, white cheeks and black cheek spot will clinch it. Just as sociable, they will mix readily with other sparrows and finches on your bird table, but you may find Tree Sparrows a little bit more wary of humans until they become familiar with their surroundings. The widespread increases in farming efficiencies have meant less spilt grain, reduced field edges for seed and insect food for the young. In addition, of course, the increased use of agricultural chemicals has also had an impact, with population estimates from the British Trust for Ornithology indicating population reductions of up to 90% in some areas. They occur mainly on the flatter farms and parkland of the east of the UK, but will venture onto higher ground in some areas, even up to the tree line of moorlands and dales. They are one of the very few declining species that we as individuals can make a definite contribution towards. While the various conservation bodies and environmental agencies work to bring about improvements in the management of their traditional habitats there is a lot you can do if Tree Sparrows are in your area. They have shown an increased tendency to visit gardens in village and town edges in recent years, and where nest boxes are provided, they will readily stay to breed. Their sociable nature means they do like to nest in loose colonies so several nest boxes or even a terrace box will help. Good quality seed in feeders, particularly red and white millet, mixed with sunflower hearts, will provide an irresistible temptation. In celebration of this beautiful and fascinating bird www.treesparrows.com was set up to inform and find more of these birds. As well as a wealth of information, a sightings page allows visitors to tell us where and when they are seeing Tree Sparrows. All sightings are incorporated into the British Trust for Ornithology’s Bird Atlas, a monumental study currently underway of the whole of the UK’s birdlife. 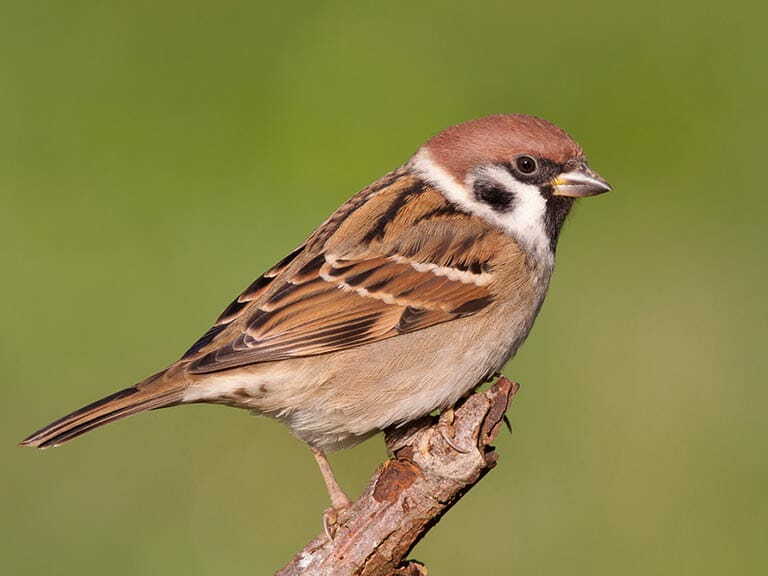 We would encourage everyone to submit sightings of any Tree Sparrows, now or in the future, to ensure this valuable study is as accurate as possible for this easily-overlooked bird. And, with your help, the future of the Tree Sparrow will be assured. So, if it’s time for a cup of tea and a well-earned chocolate biscuit, just settle down in your favourite kitchen chair and see just who exactly is coming to your bird table. Photographs: Top photo by Debbie Moore; middle photo by Geoff Hall; bottom photo by Debbie Moore.